Evaporation and overuse of water are two of the main sources of losses in irrigation. In this context, the two main solutions are localised irrigation and irrigation system scheduling. 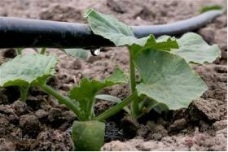 Localised irrigation or micro-irrigation involves distributing the water via a low-pressure piping system, bringing the water near to cultivated plants only. This is the most efficient irrigation method today. Sprinkling irrigation - less efficient than localised irrigation but also cheaper - involves reproducing the action of rain artificially. Both these methods save tremendously on water compared with surface irrigation methods. Irrigation scheduling consists of planning the irrigation flow rates, times and cycles based on seasonal and daily variations in climatic and insolation conditions and the type of crop, with the aim of reducing overuse and losses through evaporation. Another old technique that is used infrequently by the farmers due to the extra work involved is mulching, which simply means covering the ground with plant debris around the crops. Sprinkling is a widespread irrigation technique worldwide for it is fairly easy and can be adapted to almost all types of crop and ground. 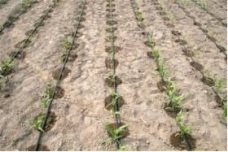 Less widespread, micro-irrigation is being used more and more despite its high installation costs. Micro-irrigation was developed towards the end of the 1960s and is mainly used in fruit and vine growing and in horticulture. This technique has experienced a considerable boom in regions with an arid climate or those facing a shortage of water resources for irrigation, like Spain, California in the USA and the north-eastern region of Brazil. Demographic growth is a major challenge for the generations of today and tomorrow : how to feed the entire population of the planet sustainably ? Agriculture accounts for 70% of the world consumption of water. In the poorest countries, this figure can rise even higher. Food safety therefore relies on the availability of the water required for agricultural production. A good number of countries are today facing a growing shortage of water resources, which increases the cost of irrigation and, therefore, of food. In this context, more efficient use of water in irrigation is a pressing need. Surface irrigation methods like flooding or runoff are the most common today. These surface methods are precisely those with the highest potential for saving water by using more efficient techniques. In addition, a large proportion of the water is taken without prior scheduling, which leads to considerable wastage by more traditional methods. The use of more efficient techniques can generate significant savings, above all in countries where the available water resources are more restricted or where the cost of water is higher. 5) What do these processes involve ? How are they applied ? Drippers are devices that bring the water randomly at low flow rates (2 to 12 litres/h) under a pressure of about 1 bar. 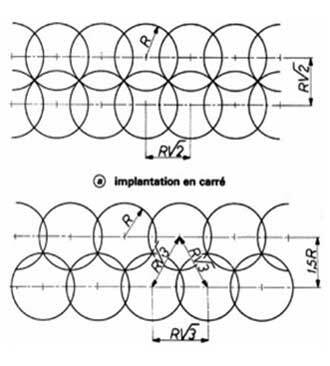 This is achieved via small diameter orifices (1 to 1.5 mm) or by routing the water in reduced section pipes (0.5 to 1.5 mm) over a greater length (0.1 to 1.0 m). Drippers are normally made of PVC. Orifice drippers have a high clogging risk. Self-regulating drippers exist that use springs or other devices to maintain a fairly constant flow rate in a given pressure range. Micro-sprinkling, a process that is frequently called a drip system, involves micro-sprinklers installed in the pipes and therefore very close to the ground. Only the surface area occupied by the crops is sprinkled, with a range of 1 to 2.5 m. The flow rates are faster than with drippers, varying between 10 and 60 litres/h. This technique is used widely in arboriculture. Such a system normally has a device at the head of the system used to adjust the flow rate and filter the water, several 10 to 16 mm-diameter PVC or polyethylene water pipes with varying degrees of density depending on whether they are main or secondary pipes and micro-sprinklers, low density polyethylene micro-pipes intended to sprinkle just one tree or plant. A third technique involves porous pipes that sprinkle the water onto the ground along their full length. Nevertheless, the risk of clogging, the irregular flow rates and that fact that that the beginning of the plant cycle, the roots are not deep enough to be supplied by the pipes are the usual drawbacks. In all circumstances, the water used by the micro-irrigation system must be filtered to minimise the risk of clogging. The next figure shows a diagram of a micro-irrigation system using drippers. Figure 1 : Diagram of a micro-irrigation system using drippers Source : SOUTTER (2007). Sprinkling is an irrigation technique where the water is brought to the plants in the form of artificial rain. The two devices most used for this technique are rotating sprinklers and rain guns. Factors affecting the design of a sprinkler system include the amount of water to be brought, the desired pluviometry, the available pressure, the soil, plant and wind characteristics and special conditions like the possibility of frost. 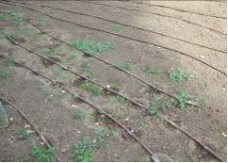 The pluviometry depends on the quantity of water to be brought as well as the slope, the type of soil and its plant cover. Excessive pluviometry risks generating phenomena such as runoff or flooded areas. 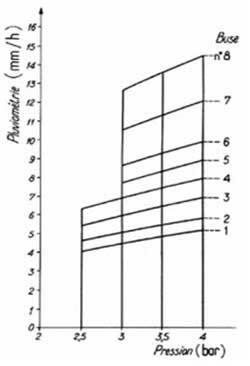 The following table gives the maximum pluviometry in several scenarios. Rotating sprinklers are the most used sprinkling devices. They distribute the water inside a circle with a radius equal to the range of the spray. These devices are placed directly in the pipes or on a support. Some sprinklers have more than one nozzle, meaning that they can achieve several pluviometries according to the available pressures. Figure 2 shows the operation of a sprinkler with eight nozzles. This type of sprinkler can operate at low pressure (1 to 2 bar), with a range of 5 to 15 m and a flow rate up to 1 m3/h, or at average pressure (2 to 5 bar), with a range of 10 to 30 m, a flow rate of 0.5 to 7 m3/h and an average pluviometry of 2 to 15 mm/h. Rain guns are high-pressure sprinklers (up to 8 bar) with a potential range of 60 m. Flow rates vary from 10 to 100 m3/h and the pluviometry from 8 to 25 mm/h. Rain guns can be fixed or mobile. They can irrigate huge areas but their large drops can damage the most sensitive plants. They are mainly used for large-scale farming and grassland. To minimise over-irrigation or losses through evaporation, improved irrigation scheduled can be envisaged. Scheduling irrigation involves deciding how many litres of water to bring, for how long and at what times of day. These parameters are affected by several factors relating to the meteorological conditions (temperature, humidity, sunshine), the soil properties (infiltration rate, slope), the type of crop and the plant growth phase. The scheduling can vary from one day to the next according to the meteorological conditions. Sophisticated scheduling that optimises the use of the water requires the opinion of a qualified professional, which can be expensive. - The best irrigation times are early morning or late afternoon. When the sun is higher, towards midday, the majority of the water is lost through evaporation. During the night, on the other hand, the water accumulates on the ground, which can cause the plants some problems. - The amount of water must be enough to satisfy the needs of the plant. These needs depend on the soil properties, climatic conditions and the type of crop. Too much water can be just as problematic as too little. - It is important to reduce or even stop the irrigation system when it rains. To find out the quantity of water each time it rains, simply measure the depth of the accumulated water column in a cylindrical receptacle open to the rain. - Regular pipe inspections are important to detect leaks or ruptures as early as possible so as to limit the water losses. Mulching involves covering the soil with plant debris at the foot of a crop. This cover has three main advantages. Firstly, it keeps the soil damp around the plant, once the evaporation is more intense when the soil is bare. Mulching also prevents unwanted weeds from growing and therefore competing with the crops for the water and the soil minerals. Lastly, as the material making up the mulch is organic, its decomposition improves soil fertility. The mulch can made up of all sorts of plants, preferably free of seeds. Hay, coconut leaves or fibres, sawdust and old plaiting are possible materials for mulching. Mulching should ideally be laid on a cool soil, after some rain and a light hoe. It is also important to grind the material to be used as much as possible. This gives better contact with the ground and accelerates the decomposition of the mulch. Remember that the mulch is not inert and therefore has to be renewed due to decomposition. These vary according to the technique used. Sugar beet is one of the thirstiest crops. Turkey is the fifth largest world producer of this variety of beet. The region of Kayseri is characterised by beet production and irrigation by traditional surface techniques is dominant. These techniques not only waste an enormous amount of water, they also cause soil erosion and salinisation and aggravate the pollution from the use of fertilisers and other products. To face up to the problem, the Kayseri sugar beet cooperative has been trying to expand the use of micro-irrigation in the region since 2005. One project was implemented from May 2006 to May 2007 with the cooperative’s own resources (US$116,300) and the United Nations Development Programme (US$37,500). The aim of the project was to improve existing micro-irrigation systems and install new, more efficient systems based on experience gleaned by the cooperative and to promote micro-irrigation to the farmers and other players involved. The micro-irrigation promotion actions include the production and a documentary and two thousand brochures on the topic, meetings with farmers, preparing a report on micro-irrigation (comparing it with other techniques like sprinkling) and building up the abilities of cooperative’s technical staff on the topic. Replacing traditional techniques with a micro-irrigation system can save up to 70-80% water. 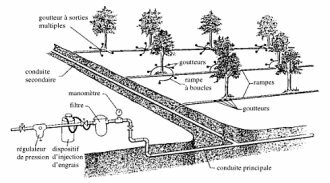 Prices will be presented in this section for certain components in a micro-irrigation system in France. These prices have been obtained from supplier Internet sites and must therefore be used only as a rough guide given that they can vary according to the model, supplier and country. - FAO site (Food and Agriculture Organisation of the United Nations) : reports are available in French and English. - Very detailed FAO manual in English on implementing micro-irrigation and sprinkling techniques. - Very detailed FAO manual in English on estimating the water requirements of plants. - English site to assist in designing irrigation systems, containing a large number of technical aspects.